EonCoat is an industrial protective coating which is radically different than any other system on the market. With just one coat, you can protect your assets for their entire lifetime. No recoating, no regular downtime, no loss of earnings. Unlike conventional industrial polymer coatings which form a sacrificial mechanical bond to the steel, EonCoat phosphates the steel it comes in contact with, forming a two-micron thick amorphous magnesium iron phosphate layer. In other words, instead of encapsulating the asset in a protective blanket, EonCoat becomes part of the steel. As a second line of defense against corrosion, a white ceramic layer forms over the alloyed surface to create a reservoir of phosphate corrosion protection – a dual-pronged attack which outperforms all other market leading steel protection systems. By chemically bonding to the surface of the steel and making it non-reactive, EonCoat isn’t susceptible to scratching or abrasion in the same way as a polymer coating, making it ideal for even the most hazardous of industrial, infrastructural or marine environments. The wide array of problems EonCoat successfully solves is far greater, and it is truly impressive. It manages to address issues and situations throughout all major industries and sectors, while its application advantages make EonCoat the absolute top choice when it comes to coating solutions. We offer a range of performance coatings to suit all asset protection requirements, including polyurea and polyaspartic technologies, polyurethane and epoxy treatments and of course, EonCoat. Call us for more details or take a look at the solutions section of our website. What materials can I protect with EonCoat? EonCoat is specifically for protecting carbon steel. What makes it so different to other performance coatings? 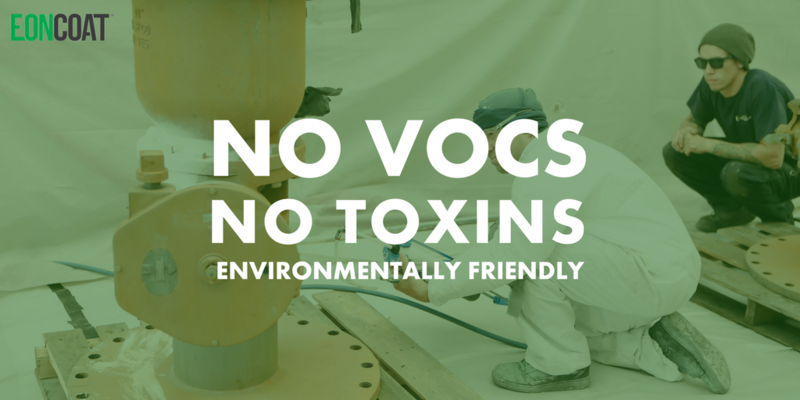 EonCoat works by chemically altering the top layer of the carbon steel, making it non-reactive. So, instead of forming a sacrificial layer around the asset, it phosphates the steel, creating a two-micron thick amorphous magnesium iron phosphate layer. Then, to create a reservoir of phosphate corrosion protection, a ceramic layer forms over the alloyed surface. This two-layer approach to protection outperforms all other market leading steel protection technologies. Tabar testing reveals that EonCoat is up to 9.6 times tougher than epoxies* and 16 times more wear-resistant than polymer paints. What does EonCoat protect against? First and foremost EonCoat protects against chemical and environmental corrosion and because it is chemically bonded to the surface of the asset, it isn’t susceptible to scratching or abrasion either. Unaltered by real-world industrial conditions, EonCoat has a flame spread rating of zero. What sort of environments would it work well in? EonCoat is proven in some of the most hazardous marine, industrial, infrastructure environments worldwide. The energy, municipal and heavy machinery sectors are also heading towards the use of this one-application, fast-return-to-service solution. 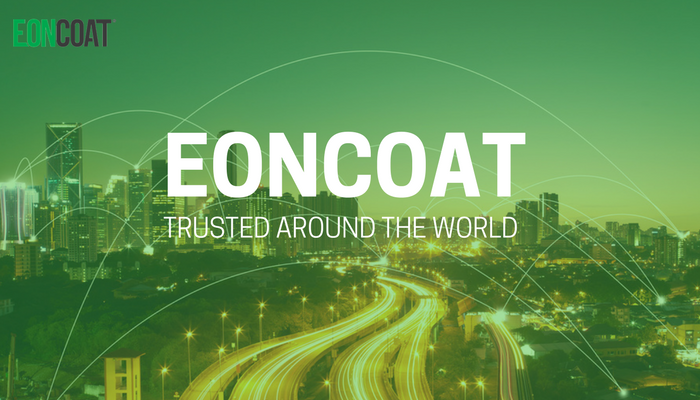 We are the registered distributor of EonCoat for the UK and Europe, so to find out more call us on 0800 0921 232 or take a look at the spec sheet. Imagine if there was a performance coating capable of protecting your carbon steel assets from corrosion for the duration of its life, in just one application. EonCoat offers a radically different approach to carbon steel asset corrosion protection and forms the latest in our portfolio of high-performance industrial protective coatings. With just a single application to worry about, you can say goodbye to the regular downtime which is synonymous with polymer paint systems. Application is fast via a standard industrial plural component spray system, allowing a rapid return to service. It dries in minutes and lasts a lifetime. Because it is completely inorganic, EonCoat also has a flame spread rating of zero – it simply will not burn, even when exposed directly to flames. EonCoat offers complete corrosion protection for carbon steel and comes with a 30 year performance guarantee. Upon application, EonCoat phosphates the steel it comes into contact with, forming a two-micron thick amorphous magnesium iron phosphate layer – becoming part of the steel. One of the world’s largest underground mines wanted to extend the life of a process hopper, that had been highlighted as suffering from corrosion to the lower steel cone during an inspection. From offshore platforms in the Gulf of Mexico to oil pipelines in China, industries from around the world are switching their asset protection specification to EonCoat.